One boy named Arata is tasked by the matriarch of his tribe to stall for time at the ceremony to become the next princess of the fantasy world of Amawakuni so a more suitable candidate can be found. The other is a first year high school student bullied and betrayed by his “friends,” first back in middle school, and now by someone else he trusted. The Amawakuni Arata appears before the current princess to start the three-day long choosing ceremony, but the 12 Shinshou, her generals that wield magical weapons called Hayagami, betray her and attempt to kill her to wrestle control from the princess and her Amatsuriki magical powers. Arata, being a witness, is threatened next but he escapes the chamber and is framed for the murder, becoming a fugitive and fleeing to a dangerous magical forest nearby the capital city. Meanwhile, Arata Hinohara, the student, walks home, alone, and wonders what use it is continuing on with friends if they all just betray you one day. Suddenly, both Aratas are snatched by some sort of magical force and placed in a state of limbo, where they briefly see each other and hear both worlds calling out for Arata to return. They land in each other’s worlds, and Arata Hinohara, still in his school uniform, is recognized by everyone in Amawakuni as the Arata that just left. He runs from the authorities that shoot arrows at him, and is rescued by a girl that had acted as the other Arata’s servant and the matriarch. 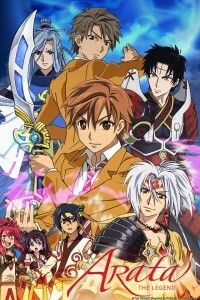 When the authorities arrive looking for Arata after this – and it is explained that although he is depicted on-screen as Arata Hinohara, in the eyes of those in Amawakuni he appears as their original Arata – he manages to take the tribe/clan’s old, rusted Hayagami and awaken it to renewed power and shininess. Whew! What a mouthful! I thought the synopses I read of the series before it aired were really confusing, and I think mine comes out that way as well, but when you watch this episode, it somehow manages to keep things quite straight and not nearly as complicated. That is to the episode’s credit. Unfortunately, that’s about all this pilot gets right. The characters, most of whom are typical bishonen, aren’t really developed very well. Arata Hinohara’s trust issues rise to the surface believably enough, and it will be interesting to see how those come into play over the course of the series, but everything else is all style and no substance. There’s also a massive classic plot hole – why is Kannagi, the long-silver-haired open-shirted Shinshou, the only one in on the attack on the princess? The others are even standing all around the dais! How hard could it have been to have a second one leap in and kill Arata as well before he could escape? The production aspects of this show are pretty shoddy, too. The CG effects for fire look like they came straight out of the mid 1990s before anyone knew what they were doing with computers, and the soundtrack was oddly synthed, also reminiscent of an era before they really bothered using orchestras to produce a bulk of the soundtracks for anime… or before synthesizers had advanced to actually being able to closely mimic real instruments. Perhaps the director, or original creator Yuu Watase herself, are still stuck living back in the Fushigi Yuugi days (also created by Watase)? When synth can be bad and plots don’t have to make any sense as long as the boys look pretty? Wait… these are still those days, aren’t they? What was I thinking? Not too excited to continue on with this one, but we can’t pick all winners, can we? Not even the weak attempt at subverting traditional gender roles can save this one for me.